I just bought a very clean but older Franklin travel trailer. A previous owner, about two years ago, installed a new converter charger, but there is no battery in the system at this time. I want to install a deep cycle battery, but don't know what to look for as far as the wiring goes, so the battery will be charged. Al, all converter/chargers will have a separate output for battery charging. If the new converter is indeed a “charging” converter, look for individual battery connection terminals. 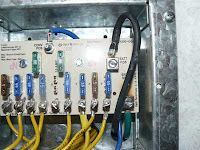 If, however, it is not a charging converter, the output wires of the converter are simply wired directly to the fuse panel for all the DC circuitry as well as a parallel connection to the battery. Most modern day RV converters are indeed charging converters, though the highly sophisticated ones with three or four-stage charging are the better chargers. Let me know the brand and model number and I’ll see if I have some further info for you. But if it is indeed approved for RV use, it quite possibly will have battery connections on it somewhere. Both the hot and the ground from the battery should be wired to the converter independently.